(Alex Brandon | AP Photo) In this Sept. 6, 2018, file photo, President Donald Trump's Supreme Court nominee, Brett Kavanaugh testifies before the Senate Judiciary Committee on Capitol Hill in Washington, for the third day of his confirmation hearing to replace retired Justice Anthony Kennedy. Senate Republicans are bringing in Arizona prosecutor Rachel Mitchell to handle questioning about Christine Blasey Ford's allegations of sexual assault against Kavanaugh at the Senate Judiciary Committee hearing Thursday, Sept. 27, 2018. Protesters are disrupting the Senate's vote on Brett Kavanaugh's confirmation to the Supreme Court. Demonstrators began shouting "I do not consent" as the roll call on Kavanaugh began. Senators are seated at their desks for the vote. When Sen. Jeff Flake of Arizona cast his vote in favor of Kavanaugh, one protester shouted, "You're a coward Flake, a total coward!" Senate Majority Leader Mitch McConnell is praising Supreme Court nominee Brett Kavanaugh as "among the very best our nation has to offer." The Kentucky Republican says Kavanaugh "unquestionably" deserves to be confirmed. He says the judge "will make the Senate and the country proud" as a member of the high court. The vote to confirm Kavanaugh as an associate justice began after McConnell's remarks. Republicans control the Senate by a 51-49 margin, and the vote seems destined to be nearly party-line. Sen. Joe Manchin of West Virginia is the only Democrat expected to vote for Kavanaugh's confirmation. Sen. Lisa Murkowski of Alaska is opposed, but says she will vote "present" as a courtesy to another Republican who is out of town. Senate Democratic leader Charles Schumer is decrying the expected confirmation of Brett Kavanaugh to the Supreme Court as "one of the saddest moments" in the history of the Senate and the U.S. The New York Democrat criticized Kavanaugh in a Senate floor speech, saying he is a nominee "who doesn't belong on the nation's highest bench." He said Kavanaugh is an "extreme partisan" who disqualified himself with testimony before the Senate Judiciary Committee. Schumer closed his speech saying Americans opposed to Kavanaugh's confirmation need to vote in the midterm election. President Donald Trump says he's looking forward to the Senate vote that's vote expected to confirm his second Supreme Court nominee. Trump told reporters as he left the White House for a rally in Topeka, Kansas, that he thinks Brett Kavanaugh is "going to be a great Supreme Court justice for many years to come." He's also praising Republican Sen. Susan Collins for the speech she delivered Friday announcing her support for the nominee. He's says, "it's a very exciting time." Grassley is praising Kavanaugh's judicial independence in a speech on the Senate floor and he says the judge won't be beholden to the man who nominated him, President Donald Trump. He accuses Democrats of doing "everything in their power" to make Kavanaugh's nomination about something other than his judicial record and qualifications. The Senate is expected to vote soon to confirm Kavanaugh to the Supreme Court. Grassley says he's glad senators had the courage to "stand against the politics of personal destruction." A final vote has been set for Brett Kavanaugh's nomination to the Supreme Court. Republicans control the Senate by a 51-49 margin, and Saturday's vote seems destined to be nearly party-line. Sen. Joe Manchin of West Virginia is the only Democrat expected to vote for Kavanaugh's confirmation. Sen. Lisa Murkowski of Alaska is opposed, but says she will vote "present" as a courtesy to another Republican who will be absent for his daughter's wedding. A large crowd has gathered on the steps of the U.S. Capitol to protest Brett Kavanaugh's nomination to the Supreme Court. Pumping their fists and carrying signs, a few hundred people climbed the east steps of the Capitol for the demonstration. The crowd has been chanting, "November is coming!" and "Vote them out!" Deborah Ramirez says the Senate is "looking the other way" when it comes to her accusation that Supreme Court nominee Brett Kavanaugh exposed himself to her when they were students at Yale. Ramirez says in a statement released by her lawyers that the FBI refused to speak to witnesses who could corroborate her story. She says senators are "deliberately ignoring" Kavanaugh's behavior. The Senate vote on confirming Brett Kavanaugh to the Supreme Court is certain to be close, even if the outcome is no longer suspenseful. Enough senators have indicated they will support him Saturday to put him over the edge, with a likely margin of two votes. That's barring a last-minute change of mind. The vice president can vote in the event of a Senate tie. That's never happened in a Supreme Court confirmation. Melania (meh-LAH'-nee-ah) Trump is offering some supportive words for Supreme Court nominee Brett Kavanaugh. Without weighing in on the sexual assault allegations that Ford leveled against Kavanaugh, Mrs. Trump says victims of "any kind of abuse or violence" must be helped. Kavanaugh denies the accusation. Sen. Kirsten Gillibrand (KEER'-sten JIHL'-uh-brand) of New York says there's one fundamental question for senators when they decide Kavanaugh's fate: "Do we, as a country, value women?" Gillibrand says women who've experienced sexual trauma are "tired of the same old scenario where the men are believed and the women are not." 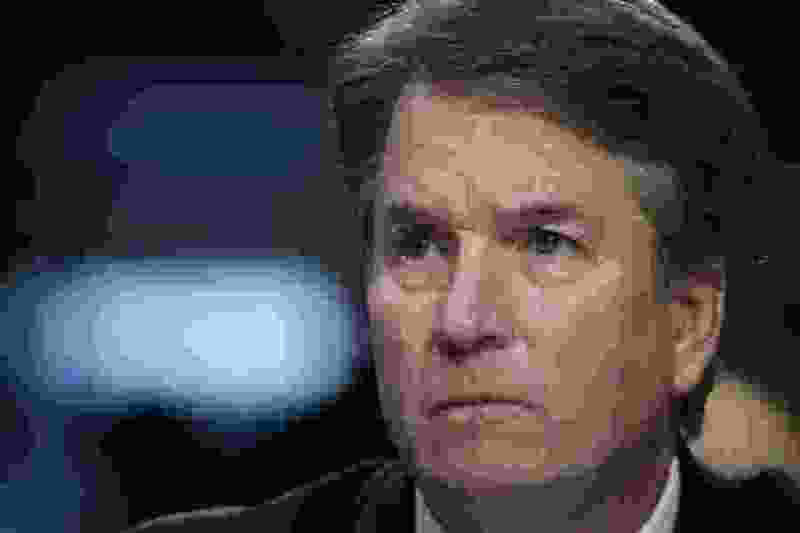 Allegations against Kavanaugh arose late in the confirmation process that he sexually abused women decades ago. He's emphatically denied the accusations. Gillibrand says that after the way Anita Hill was treated by the Senate during the Clarence Thomas hearings in 1991, "we said it would never happen again. But it did." Brett Kavanaugh seems assured of surviving a Supreme Court nomination fight for the ages after two wavering senators said they'd back him. Their support makes Saturday's vote to confirm Kavanaugh an apparent formality after a battle that riveted the nation for nearly a month. Republicans control the Senate by a 51-49 margin, and Saturday's roll call vote seems destined to be nearly party-line, with just a single defector from each side.